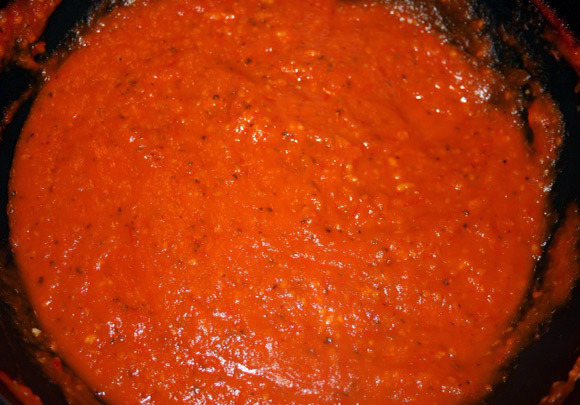 How to make tomato sauce for topping homemade pizzas. Make sure you have everything ready. In a large sauce pan melt butter with olive oil on medium heat. Add the chopped onions, garlic and cook until onions are transparent. Add other ingredients, bring to a boil and simmer on low heat for about 25-30 minutes. Remove the bay leaf. 1 tablespoon granulated sugar (optional). Stir together the tomato paste and sauce. Add the onion powder, parsley, basil, oregano, and garlic powder, and pepper, mixing well. Taste, adding salt as desired. Taste again; if desired, add the sugar.